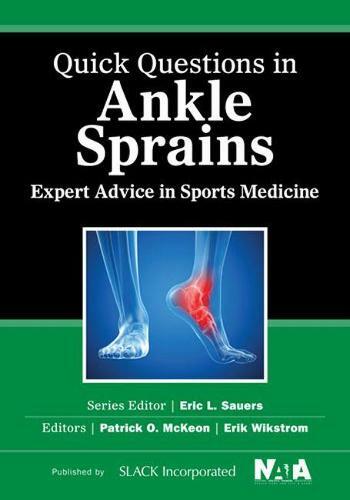 Co-published with the National Athletic Trainers' Association, Quick Questions in Ankle Sprains: Expert Advice in Sports Medicine provides concise answers to 39 frequently asked clinical questions. Written in a conversational tone, the authors of the individual questions represent a variety of different backgrounds and are experts in their respective field. The variety of questions and brevity of responses will make this a book that is easy to read and reference at the point of care. Some sample sections and questions include:Risk and reduction of ankle sprainsWhat effect does prophylactic bracing and/or taping have on reducing lateral ankle sprain risk?DiagnosisWhat are the most useful clinical tests to accurately diagnose syndesmotic and medial ankle sprains?Treatment and rehabilitationTo what extent should I use manual therapies to treat ankle sprains and chronic ankle instability?Surgical considerationsWhen should I refer my patient with an ankle problem to an orthopedic surgeon? The title says it all. This is an easy to read and accessible resource for clinicians seeking to fine-tune or refresh their knowledge about specific ankle injuries and intervention strategies. - Jeremy Marra, MS, BS Athletic Training," University of Michigan, Doody s Review Service""
"The title says it all. This is an easy to read and accessible resource for clinicians seeking to fine-tune or refresh their knowledge about specific ankle injuries and intervention strategies."